Walking fume hood are basically a bench hood that reach the floor, do allow users to walkin and out to set up equipment before and after work begins. Walking fume hood is also known as a Floor Mounted Fume hood. Our walking fume hood is designed with horizontal sliding sash , vertial sliding sash & combination sashes. 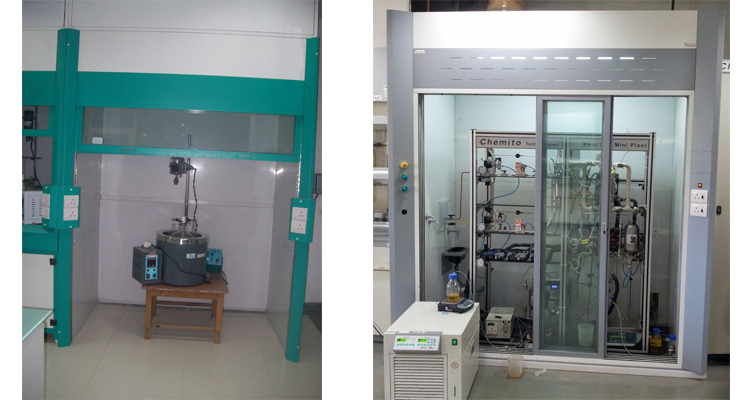 Walking fume hood is specially designed for large apparatus and storage of containers that pose some hazard, but it will not to be used as a storage cabinets. This type of a hood is also suitable for the same type of work conducting in bench top hood and distilation hood. Walking fume hood is used in pharmaceuticals,Chemicals , Bulk Drug, and oil industries for a kilolab application,processing units, distilation purpose. Our designed is based on Industy Demands , the Highest Quality Material and Latest Technology. We can also make Fumehoods as per your suitable requirements. PP Powder Coating Finish for better resistance to corosion. Removable / Preset baffel provides uniform face velocity. Removable access panel for maintainance. FRP airfoil for better resistance to corosion(Optional). Damper with Manual Adjustment Regulator. Latics Assembly to hold the appratus. © 2018 Shreyas Industries - All Rights Reserved - Designed by DreamSoft IT Solutions Pvt. Ltd.